 Mansfield Archives | What Should We Do Today? 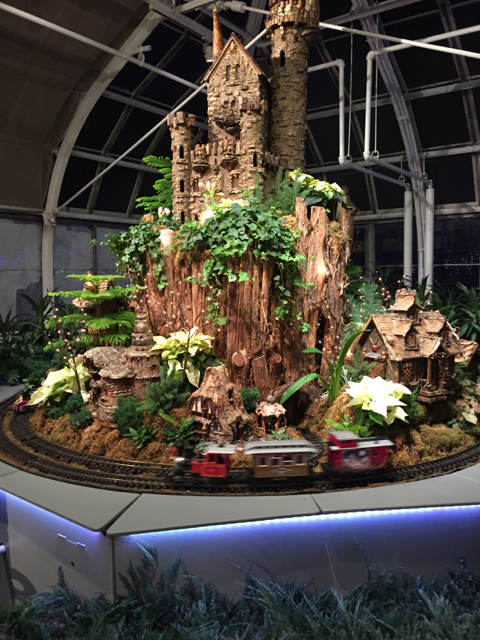 The train in the picture below is up nearly year round, but the one above makes a special appearance during the holidays! Check the link for info on Merry and Bright! 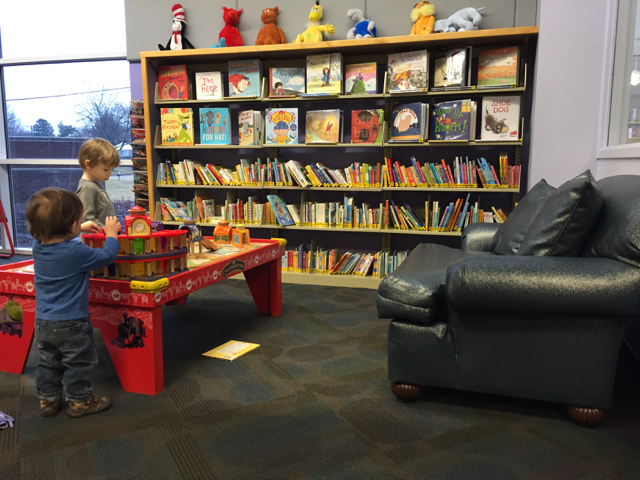 One great library with a train table! The Huntington Holiday Train arrives in mid-November and the Main Library hosts an Open House on November 30th, which will include hot chocolate and cookies, crafts and the lighting of Topiary Park! For even more trains, keep an eye on the Hilliard and Gahanna branches which will offer Polar Express programs this year! 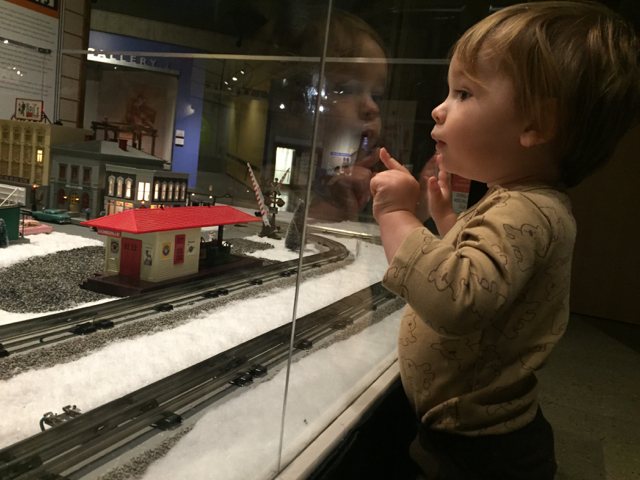 The museum has been working on repairing the tracks so no train rides are available as of today, but they hope to be up and running for the holidays! Model trains are for sale here and they also have a small play area for kids! Model trains are for sale here and there is a train table for playing. 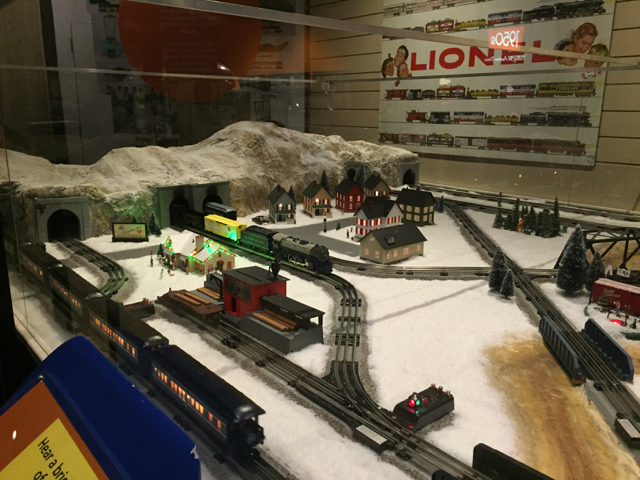 On Saturday, December 3, 2016, they will host the 2nd Annual National Lionel Train Day which will feature prizes, face painting and a visit from Santa! 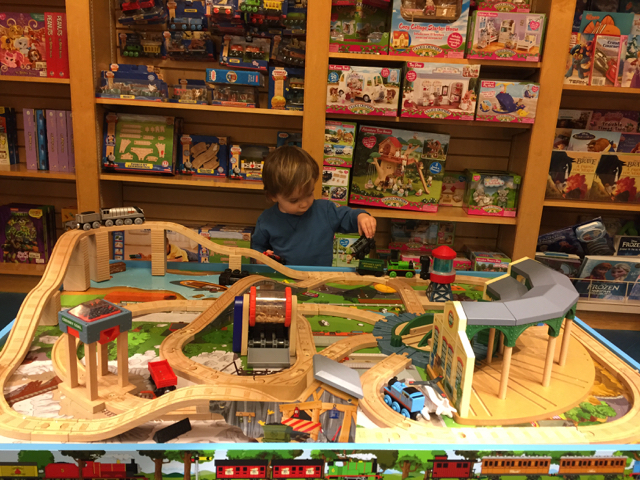 Barnes and Noble offers the hope that your children will play with trains while you quietly sip coffee and read a magazine. 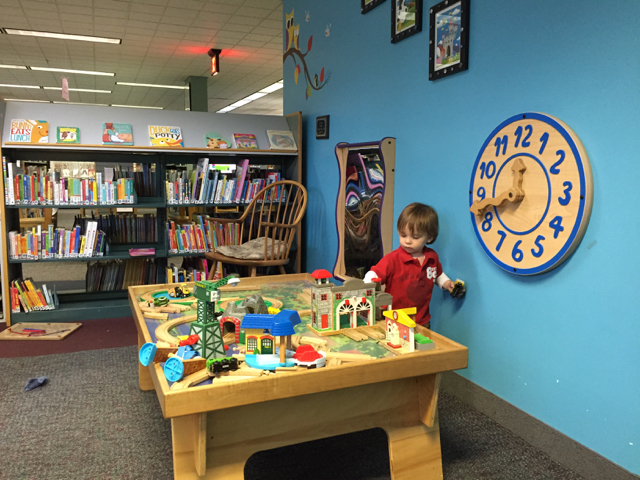 The Hilliard Branch is a fun library for kids and has a Chuggington train table. 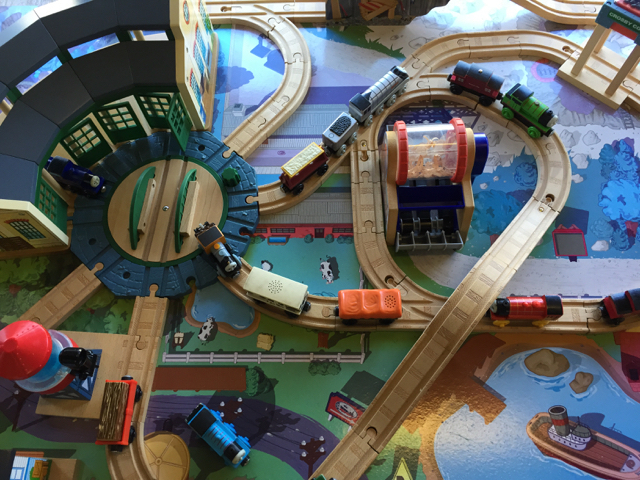 In the children’s section of the store, there is a train that runs along the wall and a train table for playing! This outdoor train track is always decorated for whatever season it happens to be and is a big hit with the kids! 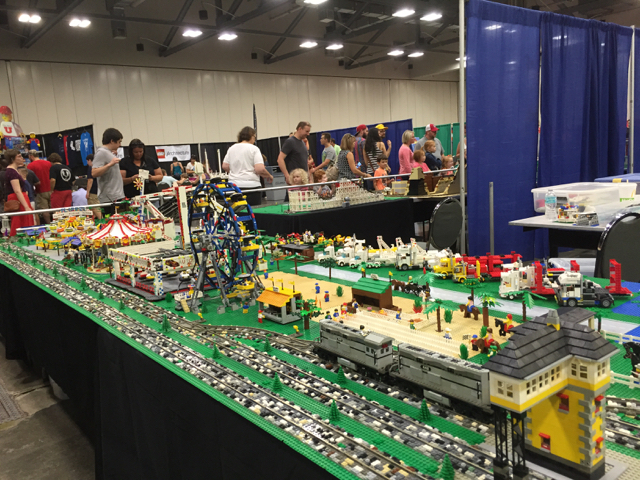 There are lots of working LEGO trains at this once-a-year LEGO Expo! 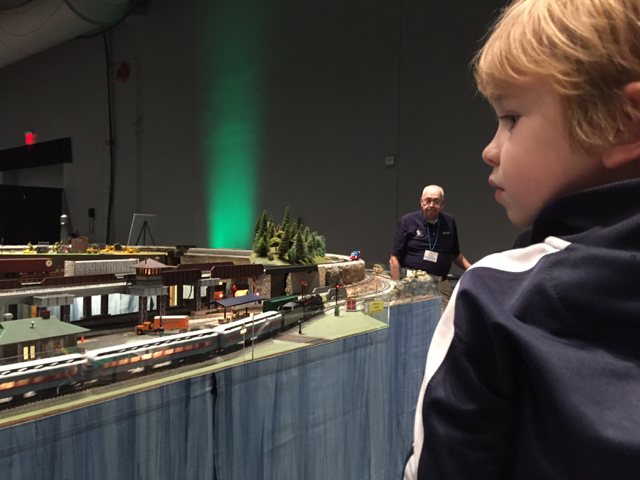 Model railroads are set up on these special open-house dates! This expo is coming January 14-15, 2017 and includes model railroads, train dealers, hands-on exhibits and more! 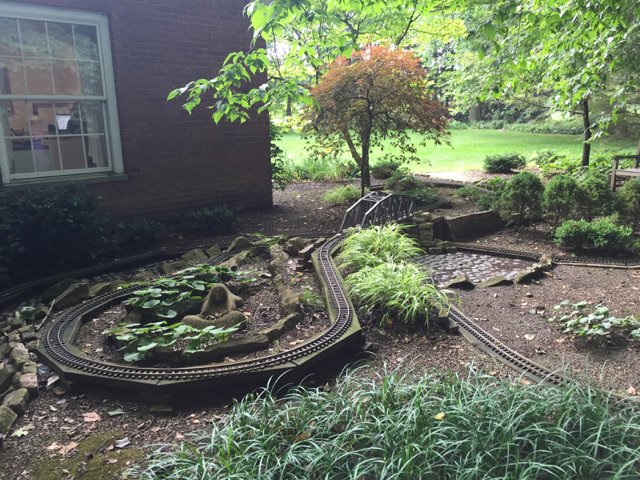 We stumbled upon this train track behind the offices at Inniswood. I couldn’t find any info on if/when it is used, but if you know, please leave a comment below! This special train is on exhibit during the holiday season! It will be on display November 28, 2016 – January 4, 2017. There are other trains on the grounds of the Ohio History Center year round, including one inside the building that can be sat in, and the one seen below that sits outside. This is a great park with a train that can be played on! 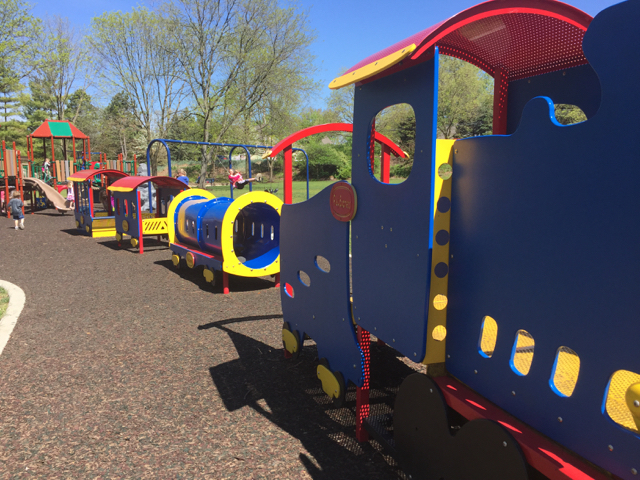 This park is affectionately known as “the train park” – and aptly so! 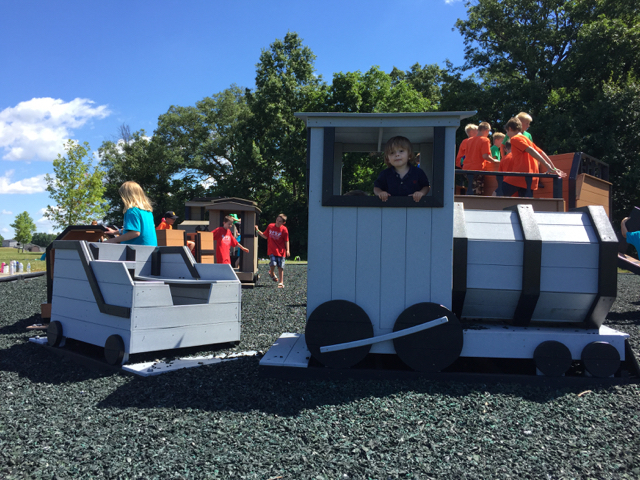 This park offers lots of vehicles to play on including a jeep, boat and this wooden train! For $1 per person, you can ride a train around the North American exhibit at the zoo! 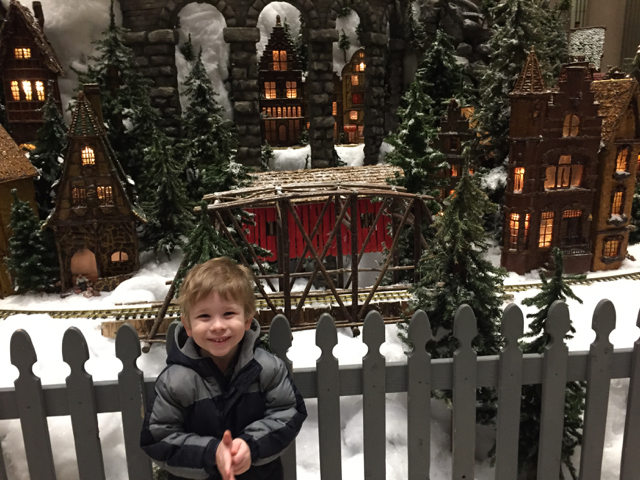 For 4 weekends in December, the club puts on an open house featuring giant model railroad layouts, an interactive Thomas the Tank Engine display and more! Admission is free! On the second Sunday in September, members of the Columbus Garden Railway Society open their houses (gardens!) 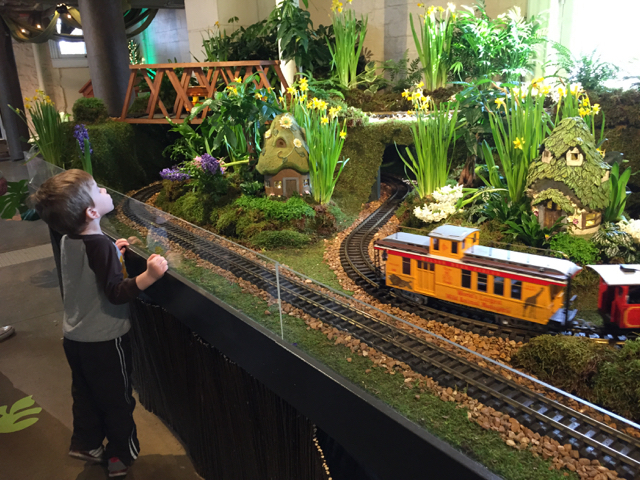 for a tour of their own Garden Railroads! BEYOND COLUMBUS . 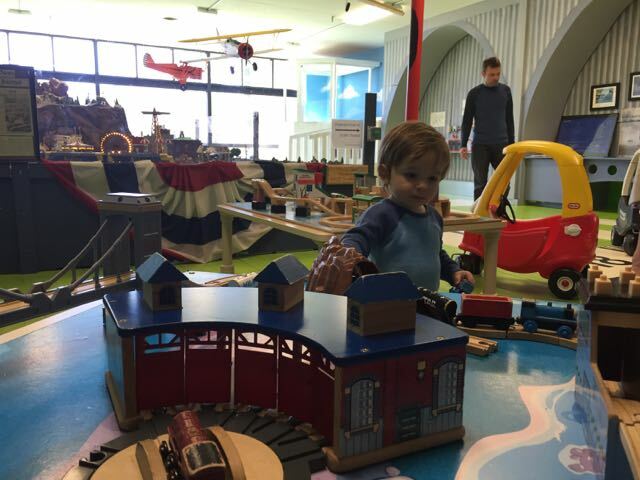 . .
One of the larger exhibits at the Little Buckeye Museum is the model train display and nearby train tables for playing! 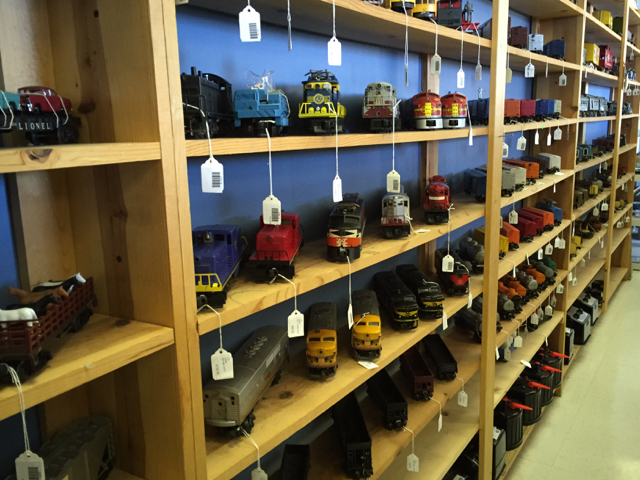 There are tons of trains on display here, may of which you can climb aboard! 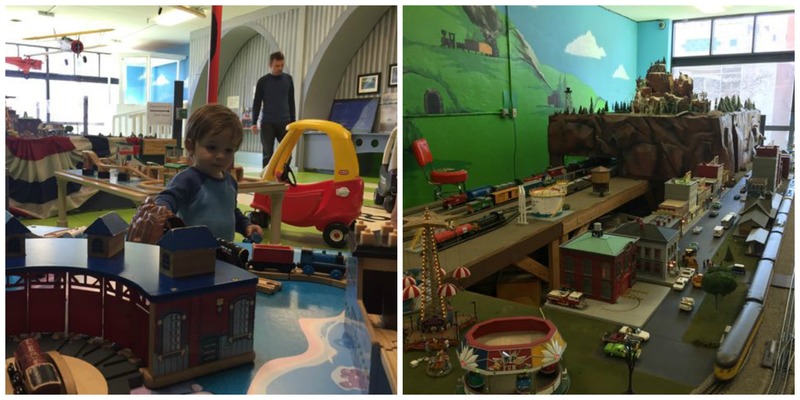 This museum has indoor and outdoor components and the gift shop has a train table for playing! 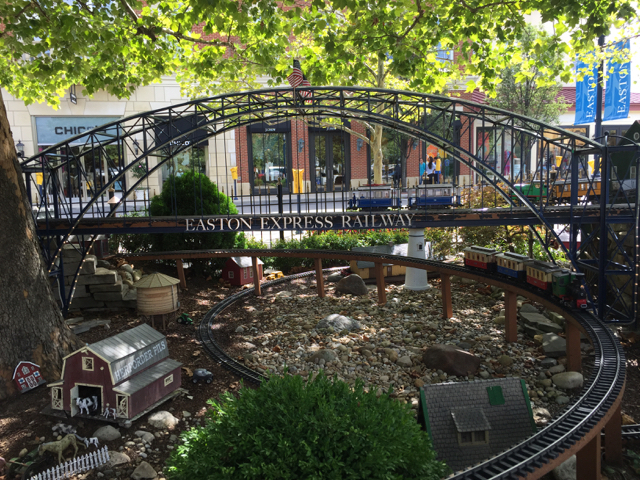 This organization offers train rides and holiday events (including the North Pole Express), a museum, gift shop and model train displays! 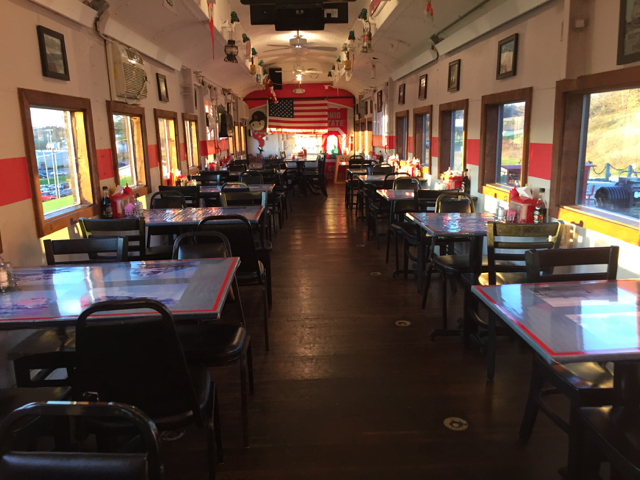 Eat dinner in an OSU-themed train car! 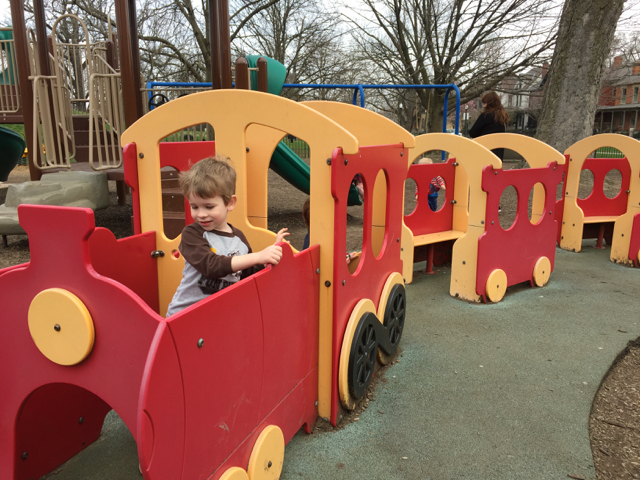 There is a train playground outside too! 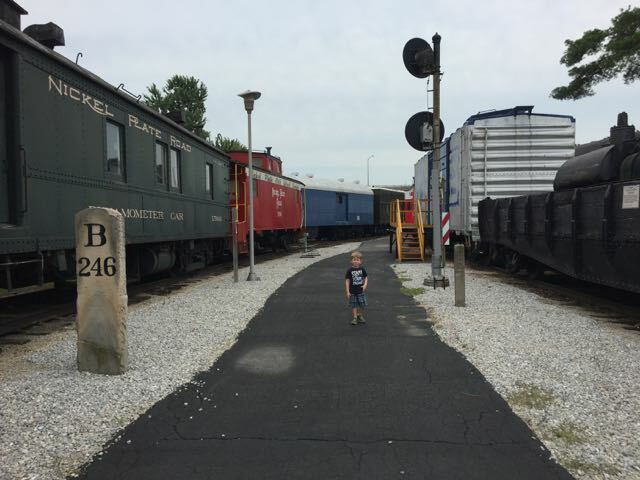 This museum has a railroad car just for kids, model trains and a scavenger hunt just for kids! This outlet mall is built with a train theme! 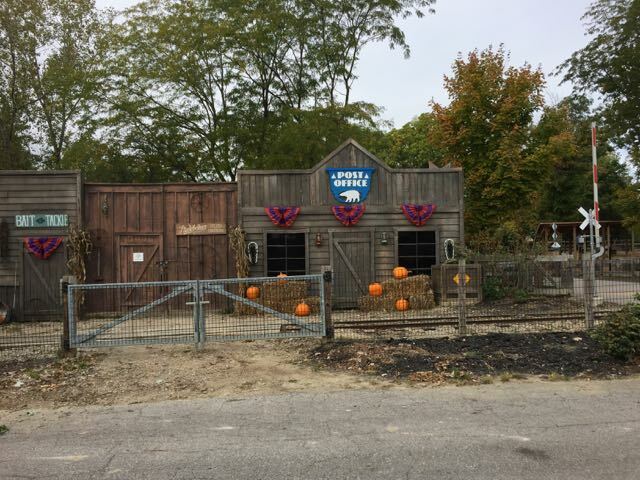 You can purchase tickets to take a train ride around the property! 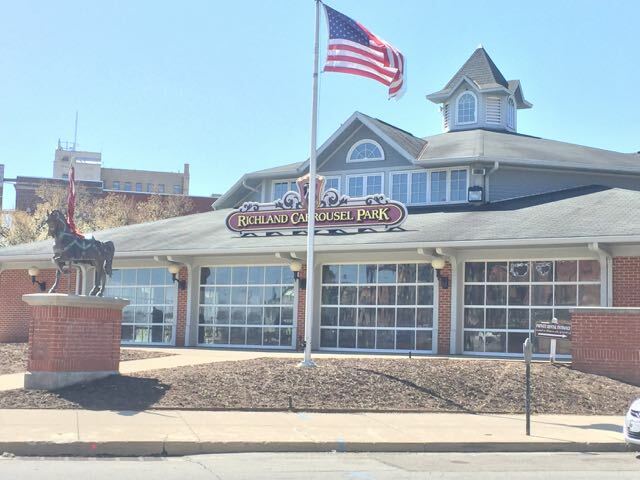 This venue offers displays, a museum, seasonal rides and a funhouse! 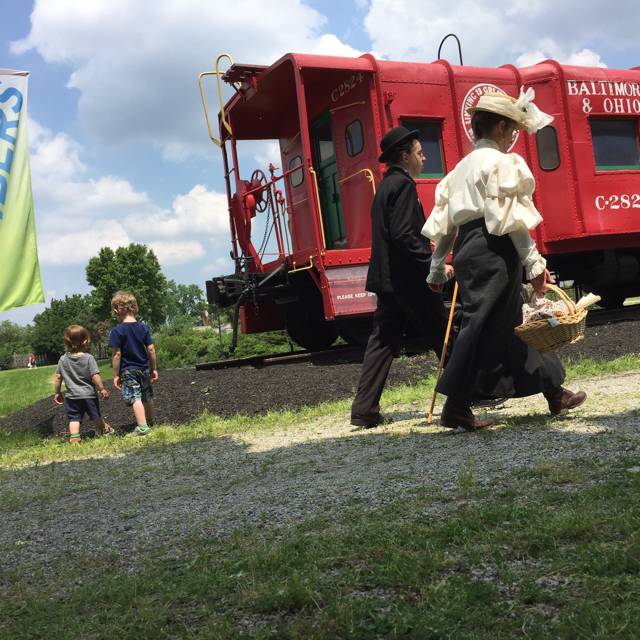 These special days only happen a few times a year at Ohio locations and include a 25-minute train ride, kids activities, live music and more! The trains here run mainly on the weekends and there are several events scheduled throughout the year, including a Christmas Tree Adventure! 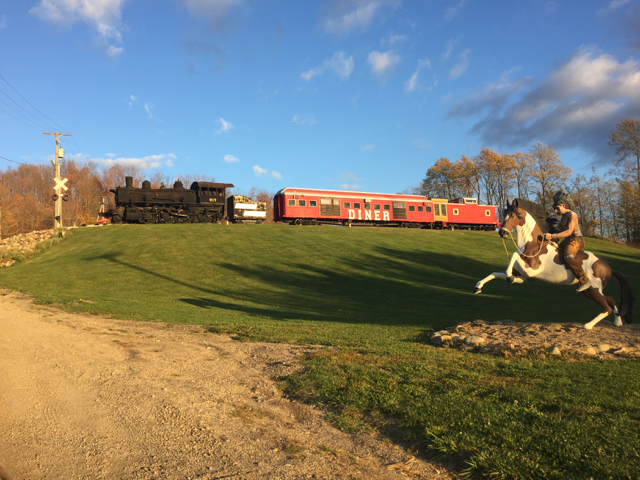 This railway offers special trips throughout the year including a Santa Train on December 18, 2016. Tickets are limited. This historic railroad offers special events including the Day out with Thomas and North Pole Express! 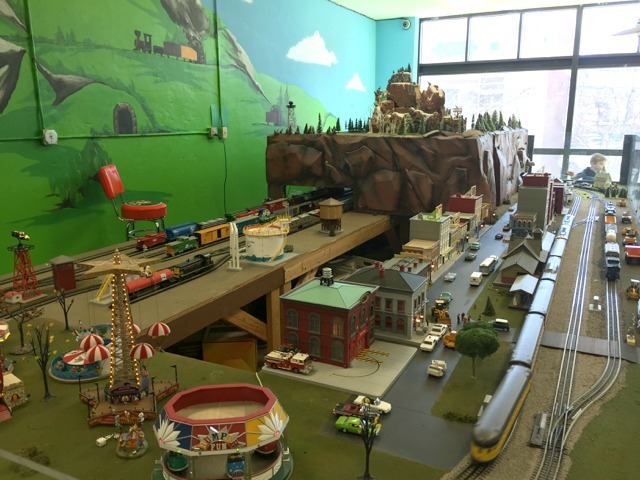 One of Ohio’s largest multi-gauge model railroad displays open to the public! Trains are for sale in the gift shop as well! 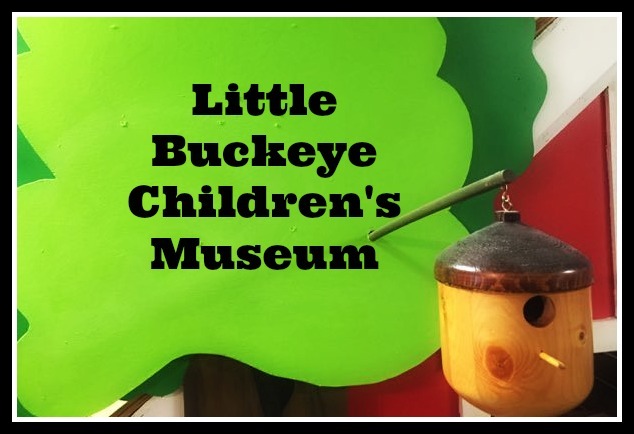 A few weeks ago, I shared in depth about our trip to Little Buckeye Children’s Museum. 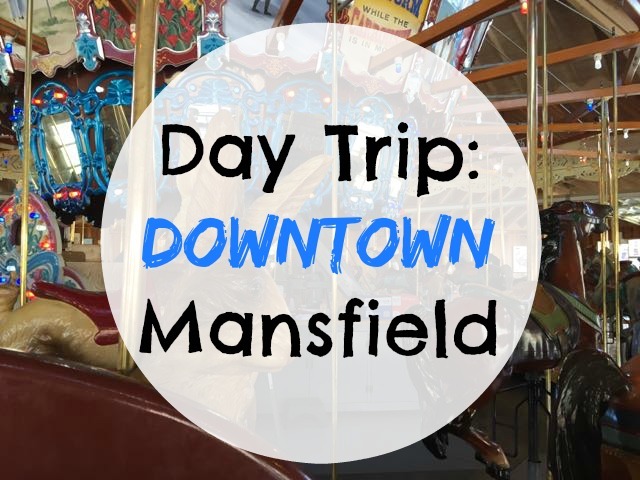 This week I’m going to give you the details on how we spent the whole day in downtown Mansfield, also known as the Carrousel District. 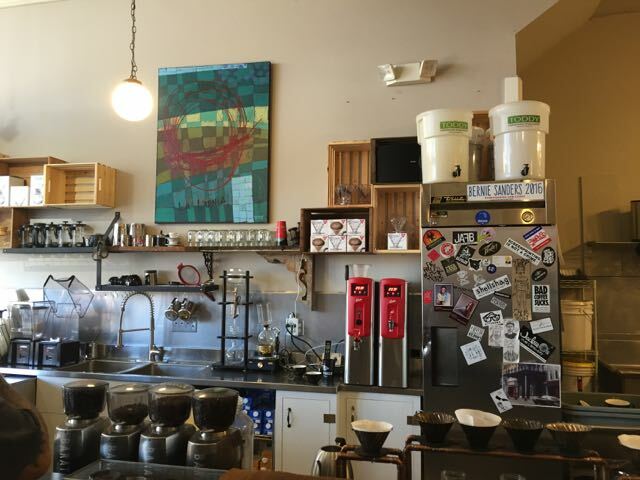 If you’re looking for a fun road trip this summer, I think this outing is worth the drive – which is only about an hour from downtown Columbus. 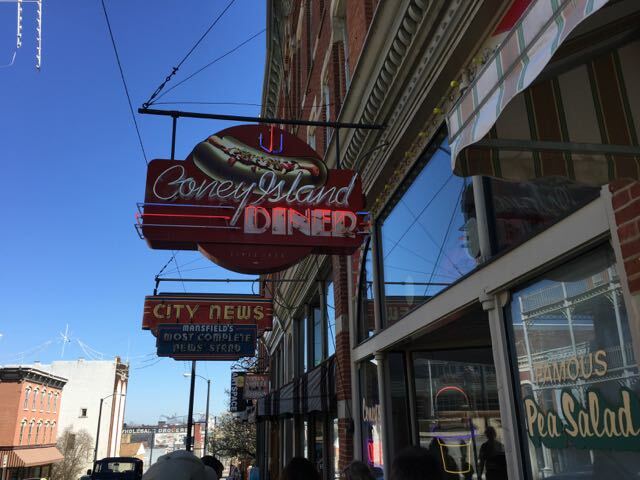 We started out with lunch at Coney Island Diner. 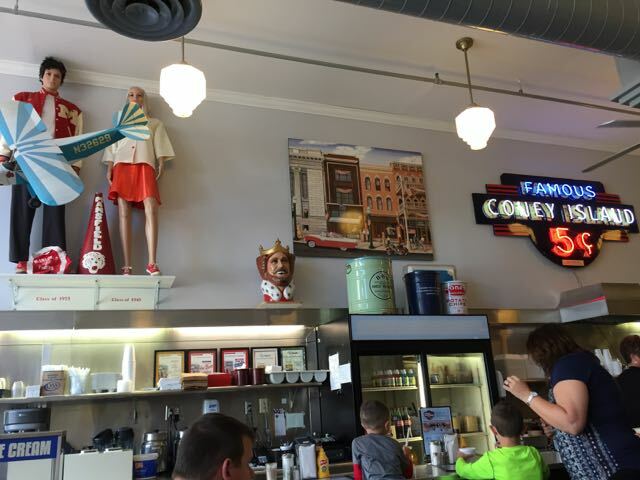 a fun, colorful diner that traces its roots back to 1919! There’s lots to look at on the walls and a very reasonably priced kids menu (the kids meals were served in fun dinosaur plates!). We made it for an early lunch and beat the rush (it got really busy around noon). If you wanted to make it earlier, they have a decent sized breakfast menu as well. You can view the whole menu here. 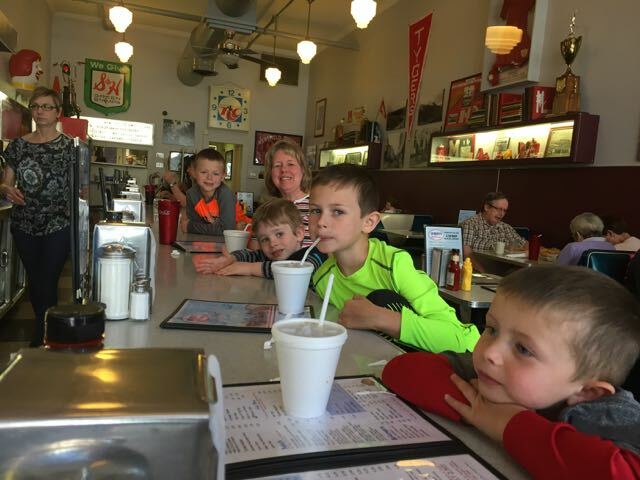 The kids had fun sitting at the counter (of course they all fought over who got to sit by Grandma)! 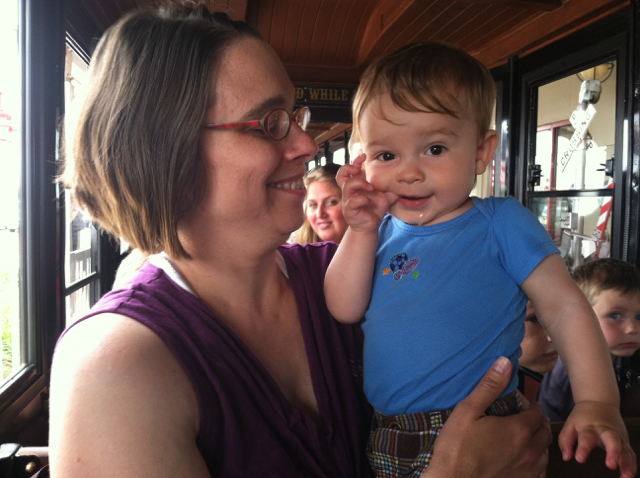 After lunch, we walked over to the Little Buckeye Children’s Museum, which is where we spent the bulk of our day. 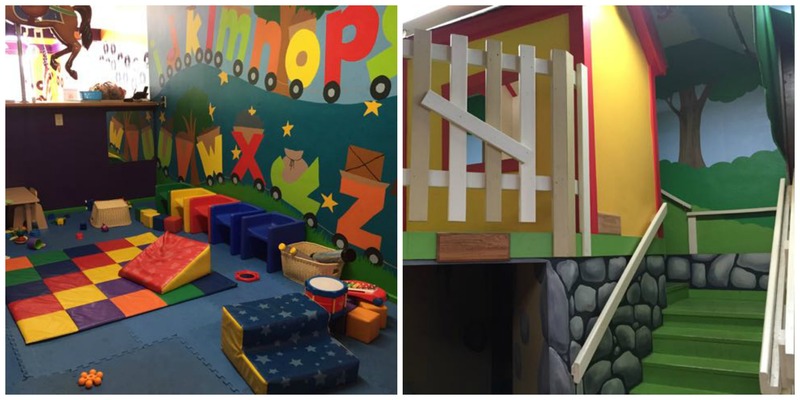 The museum is 2 floors full of opportunities for imaginative play for your kids. 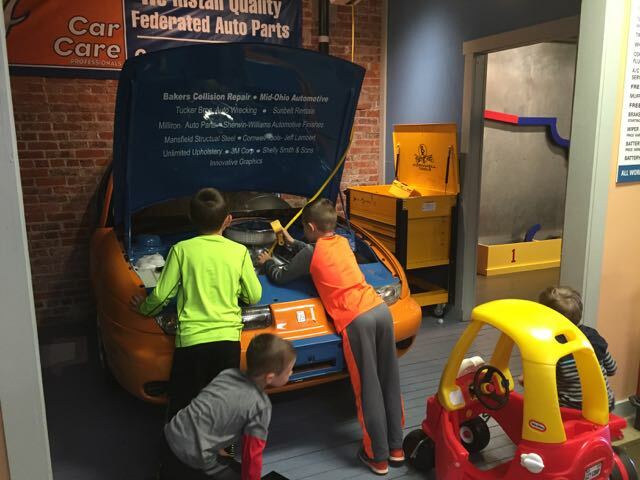 Designed for ages 12 and under, the museum was a hit with my kids and my nephews! 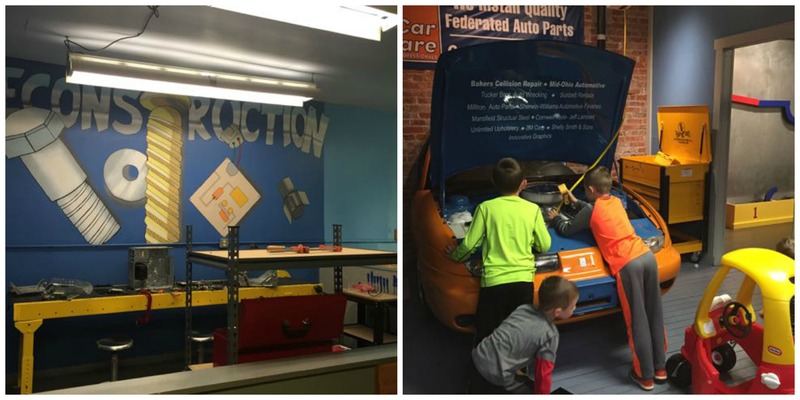 Much of the museum is set up like a town with areas to play like an auto repair shop, grocery store, hair salon, school house, and more. 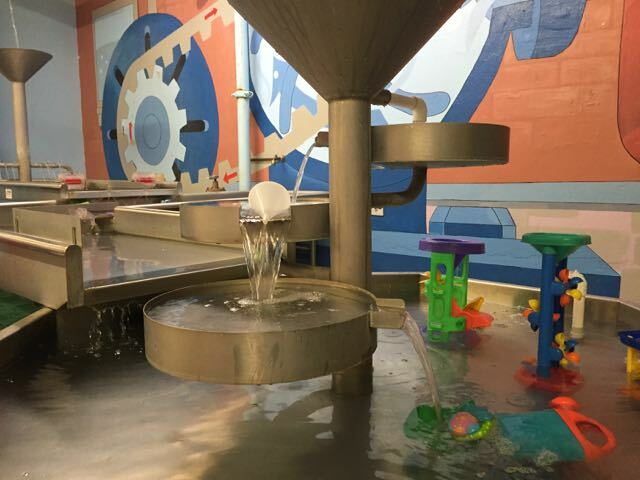 There is also an area for water play, vehicles to ride on, a baby area and space for birthday parties. You can read in depth about our visit to the museum here. 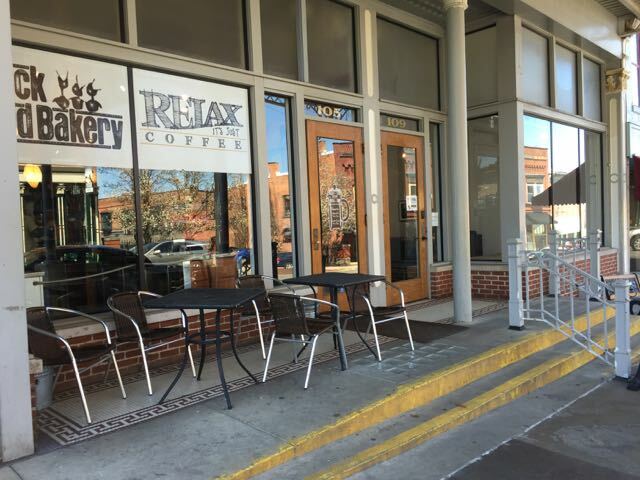 After 3 hours at the museum, a few of us adults had to make a stop at Relax it’s Just Coffee for our afternoon pick me up! There was a good looking selection of baked goods (one of my weaknesses) and a definite artsy vibe. 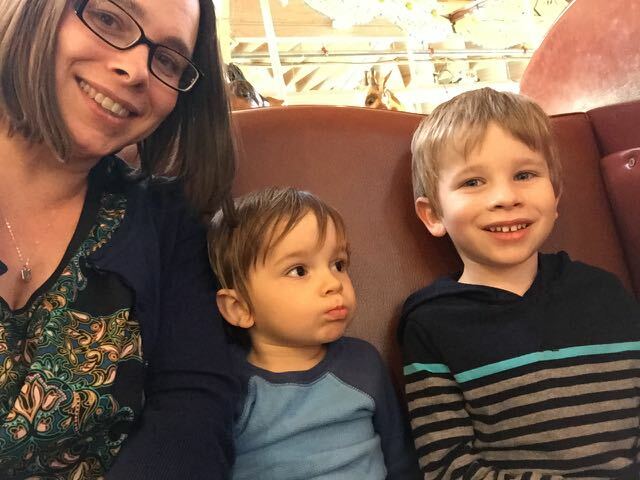 If we were kid-free I would have loved to spend more time here – you know, actually sit down at a table and leisurely drink my coffee, but we all know that is not how coffee is consumed once you become a parent. Coffee in hand, we headed down the street to the carrousel. This carrousel was built in 1991 and has 52 figures to ride on, including a couple of chariots to sit in if your kids are too little or afraid to ride by themselves. There are also several rocking chairs to sit in around the carrousel for those who just want to observe. 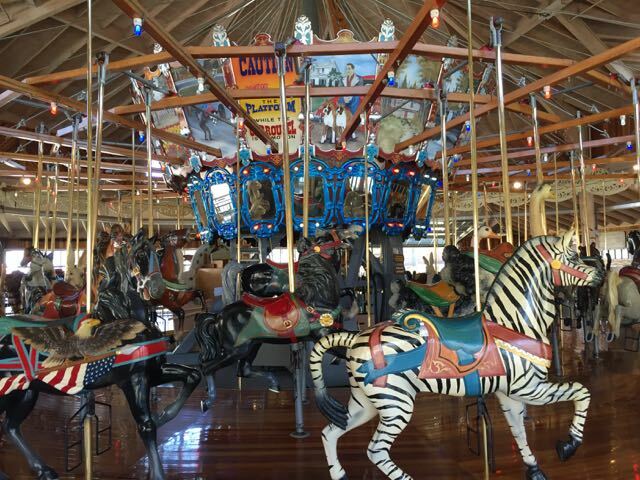 Tickets to ride the carrousel are purchased inside the gift shop where there are also concessions available. Ages 2 and under are free and all others are $1 per ride or 6 rides for $5. I don’t think you can go to the Carrousel District without stopping for a ride on the carrousel. It just wouldn’t be right, would it? 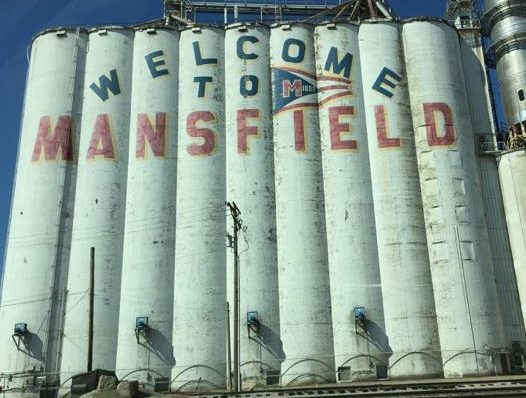 Here’s what I love about this day trip to downtown Mansfield – you can park in one spot and walk to all of these places. I really hate dislike getting my kids in and out of the car a million times during an outing. There is a public parking lot at the corner of Main St. and Fourth St. You can park there for 3 hours. That might not be long enough to do all of these things, so if you’re lucky enough to have another adult with you, send them to move the car. 😉 There is also metered parking on the street and street parking is free on the weekends! 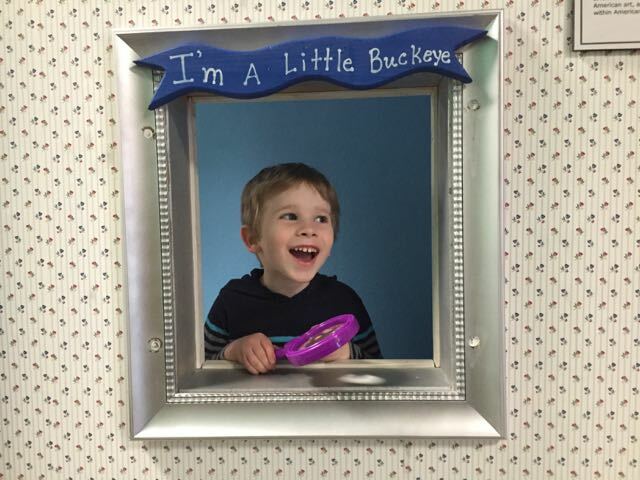 We were recently invited to visit the Little Buckeye Children’s Museum in Mansfield. My brother and his family happened to be visiting my parents in Wooster from out of state, so we turned our trip into a family outing, complete with Grandma and Grandpa! 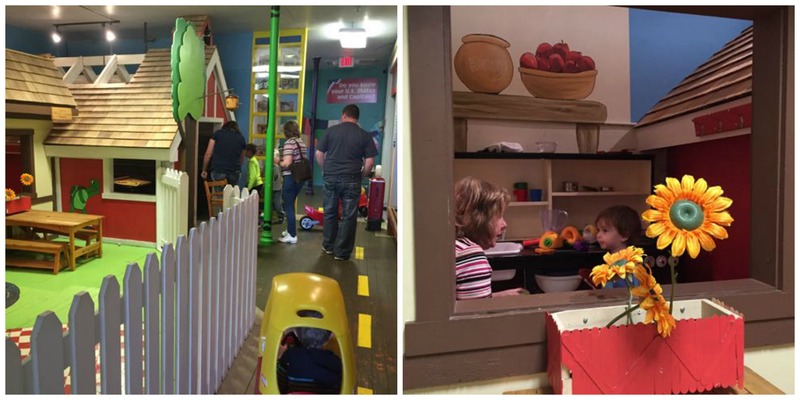 The Little Buckeye Children’s Museum is 2 floors of imaginative play for young children. We spent about 3 hours here and we still had to drag our kids away! 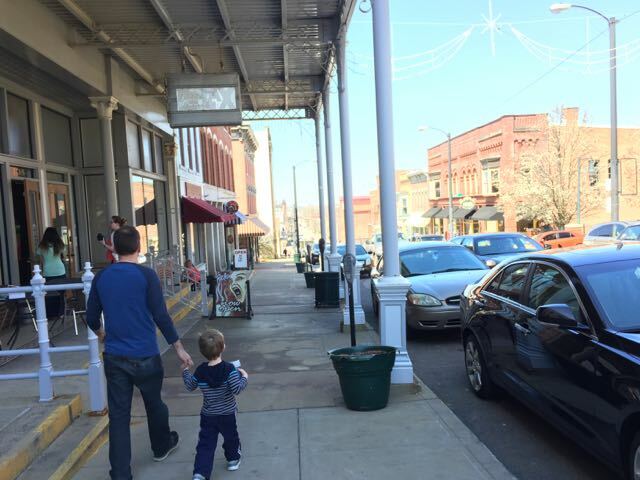 The museum is geared toward children up to 12 years of age and has been in downtown Mansfield since April, 2011. 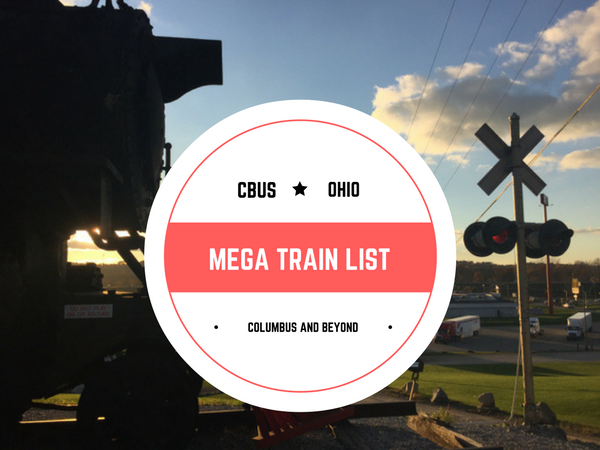 The museum is about an hour drive from downtown Columbus. 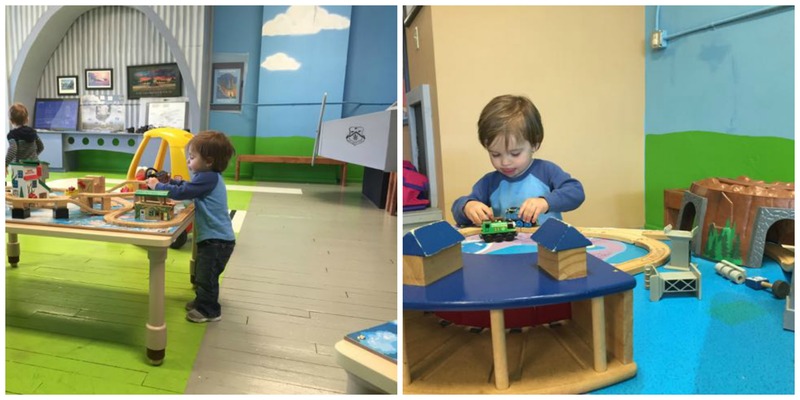 I don’t think you’ll regret the drive, the museum is tons of fun for kids! The 5 kids in our group ranged from age 1 to age 8 (all boys!) and they were all entertained 100% of the time! 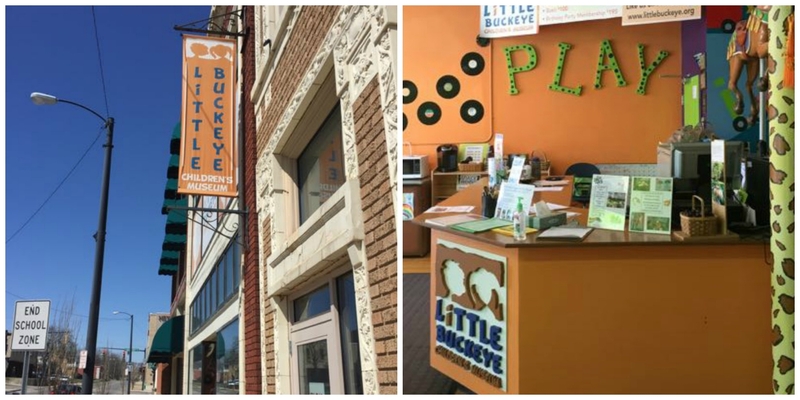 It just so happens that this Friday night (May 6, 2016), Little Buckeye Children’s Museum is celebrating their 5th anniversary during Mansfield’s First Friday Shop Hop! During this Birthday Party there will be crafts, games, cupcakes, prizes and more! Find out more information here. Sounds like a fun time! When you walk through the door, you enter into a bright and cheerful front lobby. 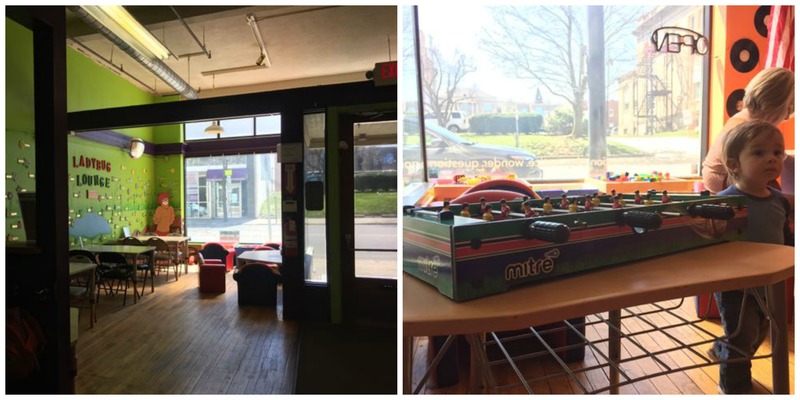 There is a seating area and table top games for kids. Food and snacks are limited to this area, and it would be great for a snack break or a packed lunch. The museum has snacks like Goldfish crackers, trail mix, and Oreos for sale as well as water, juice boxes and a Keurig machine for coffee and cappuccinos. I will walk you through the two floors of the museum. There is so much to do here and I took WAY too many pictures! 😉 Hopefully all the pictures will help you see how much fun there is to be had! My 4 year old ran around saying, “This place is awesome!” so that should give you an idea of the level of fun we’re talking about! 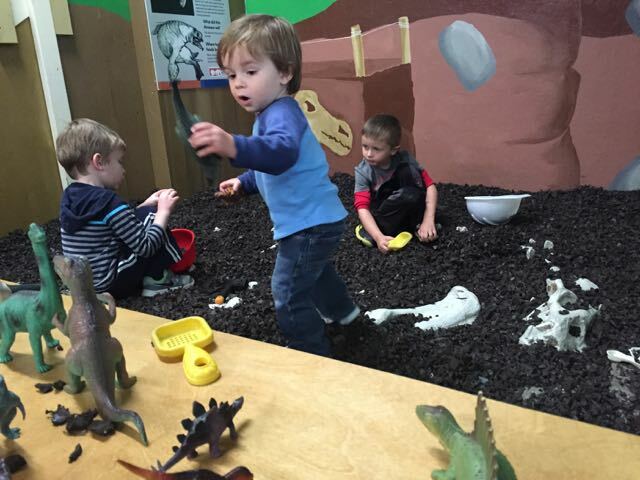 The first floor begins with a baby play area, a play house with a slide, and an area to dig for dinosaur bones. If your kids are like mine and would rather dig through mulch than play on playground equipment, they are going to love digging through the rubber “mulch” for dinosaur bones! On down the hallway, the museum is set up like a little town. There’s a veterinarian’s office, grocery store, bank and hair salon. My oldest particularly liked playing in the grocery store: filling up his cart, checking out and then restocking the shelves! And I thought he wasn’t paying attention during those frightful trips to the grocery store with two young children (serenity now)! Opposite the shops is a water play area. Smocks are provided to keep your little ones from taking an extra bath for the day! Towards the end of the hall is a farm and garden themed area, as well as a treasure trove of costumes and musical instruments for use in your very own production on the stage at the very end of the building. I love the idea of this stage! The costumes and instruments are great inspiration for any kind of show your child dreams of putting on! There are theater seats for the audience, a soundboard and keyboard at the back, and a TV where your little performers can watch themselves put on a show. My normally reserved 4 year old really came alive on this stage. (He gets that acting bug from my husband, NOT me, in case you were wondering.) The second floor of the museum begins with a transportation theme. 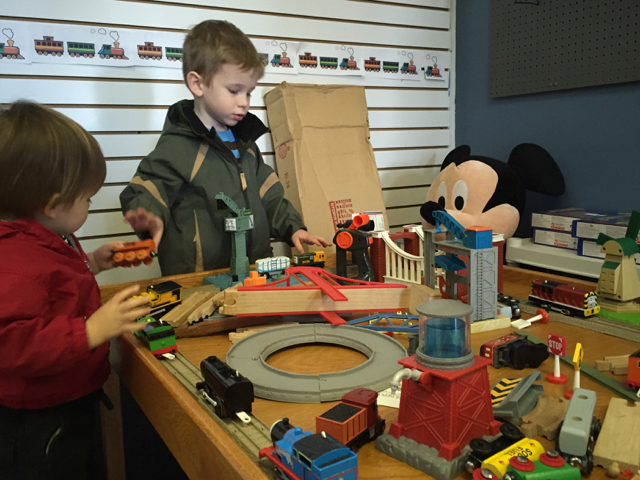 There is a large model train set and a few small train tables for hands on playing. There is also an airplane and airport related decor. 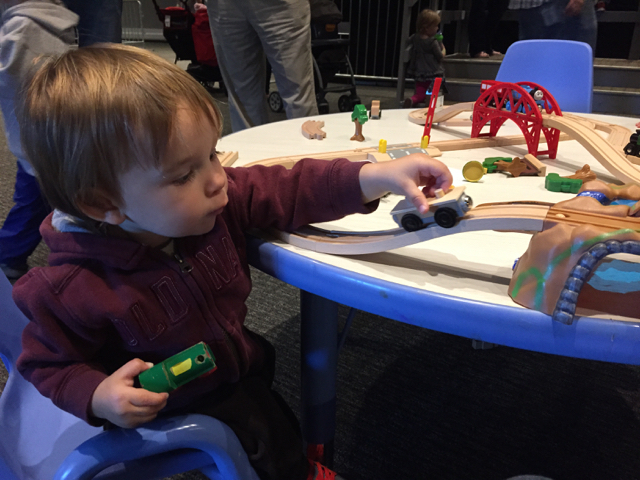 My almost-2-year-old is really into trains right now and he could have stayed here all day! 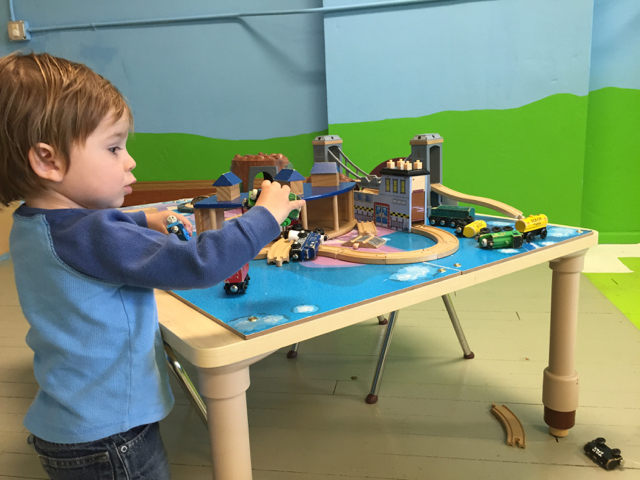 I almost feel guilty that we’ve made it nearly 5 years with two boys and we still don’t own a train table . . . On down the hall on the second floor, you will find an area for studying insects, a deconstruction zone for technical building, an auto repair shop and a dentist’s chair. 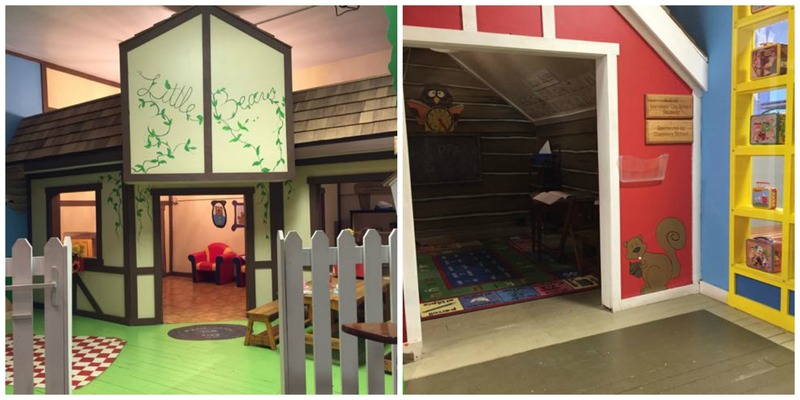 Continuing our way down the hall, your kids will enjoy playing in a play house and school house. The road painted on the floor is fun for kids to scoot around on, on one of the many vehicles provided by the museum, as they make way about town. 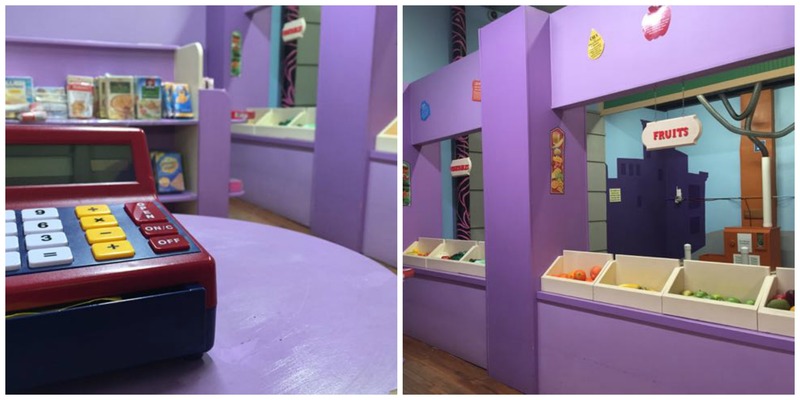 I love how this museum is set up for play. All around the museum are quotes about how kids learn from play. For example, “It is a happy talent to know how to play,” by Ralph Waldo Emerson. 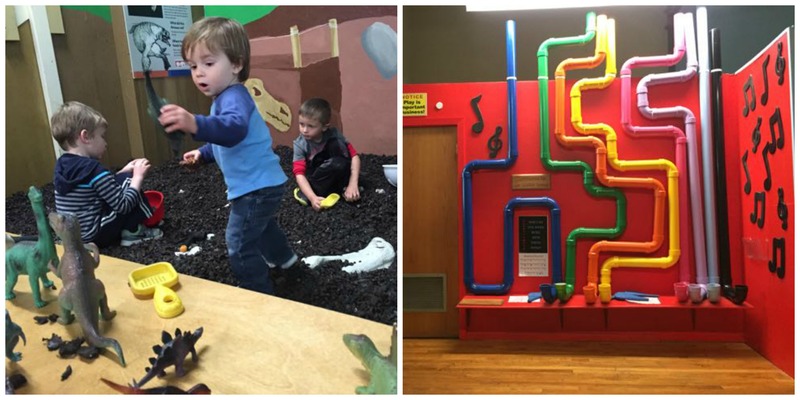 I am always a big fan of free play and this museum is just full of ways kids can use their imagination to act out the tasks we adults take for granted in everyday life. One of my favorite memories was of my nephew, dressed in a pilot’s uniform, carrying his suitcase, running down this road saying, “I’m off to work!” (Meanwhile us adults are sitting there wishing we could have the freedom to play all day like these kids!) Ahhhh . . . I never truly understood the phrase “youth is wasted on the young” until I had kids! 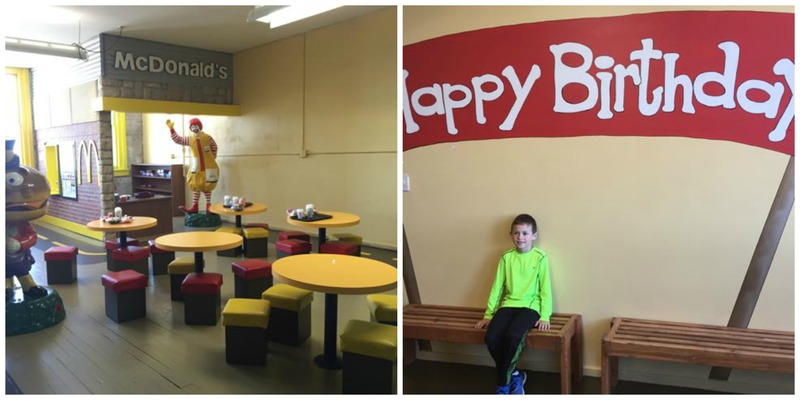 More information about birthday parties can be found here. 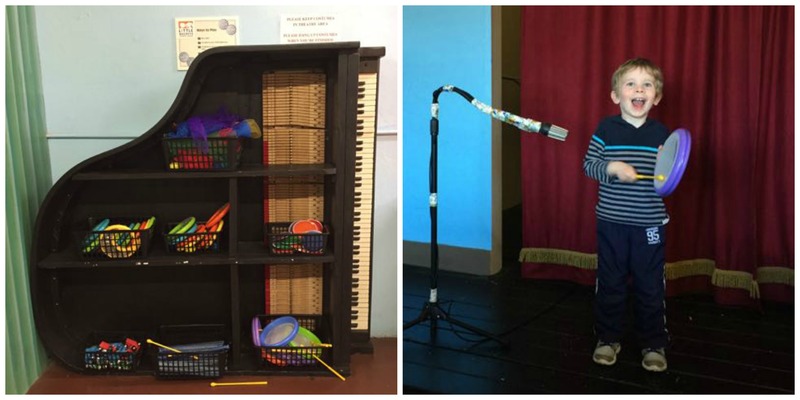 The museum also offers special events throughout the week such as music and story times, crafts and seasonal parties. Information about these special events can best be found through their Facebook page. 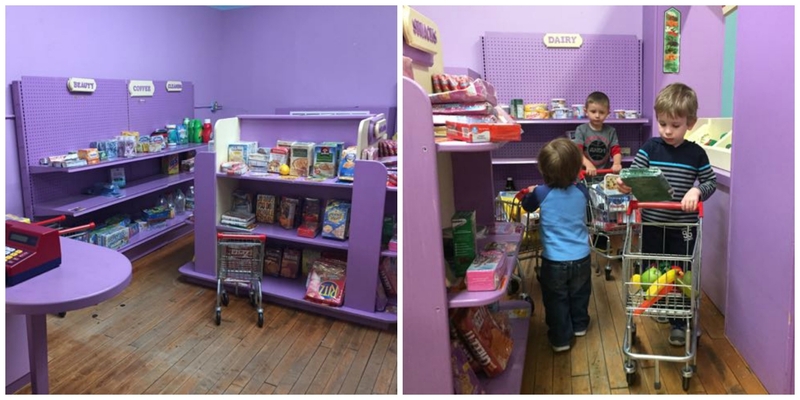 I wanted to devote a lot of space to show you all that is here at Little Buckeye! Check back in the next couple of weeks because I’ll be showing you how we spent the rest of our day in downtown Mansfield! We had a really great day and I know that we will be coming back to do it all again! Cost: $7 per person over the age of 2 (including adults). 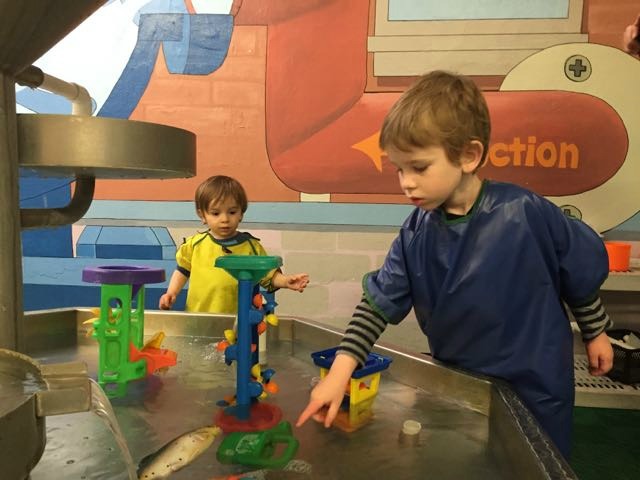 Membership packages are available and an Association of Children’s Museums Reciprocal Membership card (with ACM LOGO) will get you half-priced admission for up to 6 people in the family. Parking: Parking is available in a public lot at the corner of Main St. and Fourth St. Street parking is free on the weekends. The museum has an ongoing campaign to replace the elevators in the building, but at this point in time they do not function and you must use the steps to get from the first floor to the second floor. Something to keep in mind if you rely on a stroller or a wheelchair.